If you have ever stayed at a Doubletree Hotel, you will probably remember only one thing about your visit: they give guests warm chocolate chip cookies at check in, and pretty much any time you feel like wandering down to the main desk to get one. And the cookies are fantastic: warm, chewy, packed with chocolate chips and nuts (yes, even I liked the nuts in these cookies, though I usually omit them at home). Many recipes claim to be the real Doubletree version, but this recipe is the closest that I have found. 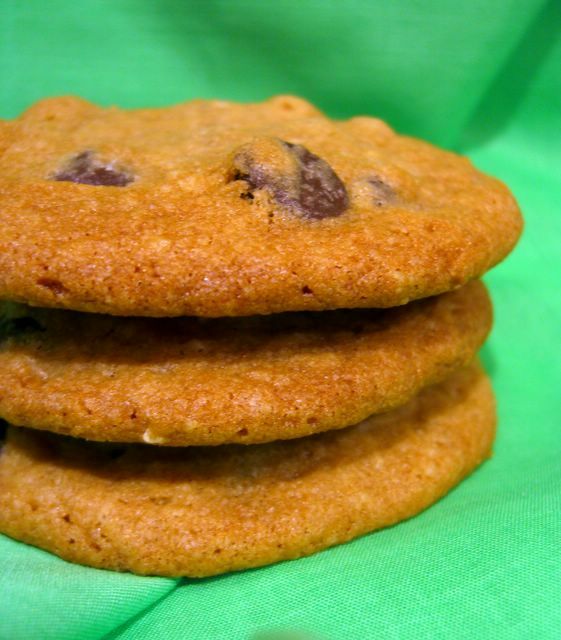 It makes cookies that are large, chewy and dangerously addictive. I make them about hald the size that the recipe recommends (2 tbsp instead of 1/4 cup) and only sometimes chill the dough. In either case, they turn out well. The only thing you have to watch is the baking time, because these can go from done to over-done in less than a minute. The cinnamon is minimal and not really present in the final cookie, it just adds to the depth of flavor. The vinegar adds a lightness to the cookie, really giving the baking soda something to react with. Now, in all honesty, I can’t say that this really is the recipe for Doubletree’s chocolate chip cookies and unless I ordered some online and did a side-by-side taste comparison, I can’t even guarantee that they will taste exactly the same. What I can guarantee is that these are excellent cookies that are at least as good as the original Doubletrees that inspired this. Preheat oven to 350 degrees. Grind oats in a food processor until very fine and almost powdery. Put tthe oats with the flour, baking soda, salt and cinnamon in a medium bowl and stir to combine. In a large bowl, cream together the butter and sugar. Beat in the vanilla and vinegar, then add the eggs in one at a time. Gradually, on low speed, add in the flour mixture. Stir in the chocolate chips and walnuts by hand. Divide dough into 2 tbsp balls and place on a parchment-lined baking sheet (dough can also be chilled for a slightly less-spread out cookie), leaving about 2 inches between each ball so the cookies can spread. Bake for 13-15 minutes, until golden at the edges. Cool for about 4 minutes on the baking sheet, then remove to a wire rack to cool completely. Now this is my kind of hotel! What does the addition of vinegar do to the taste of the cookie? I do remember the cookies at Doubletree! And it’s been about 15 years since I stayed in one. I’m always looking for different chocolate chip cookie recipes–sometimes slight tweaks make a big difference. oh I want to go to a doubletree hotel as well!!! Doubltree cookies are the best I’ve ever had. Other than the vinegar (my recipe uses lemon juice) the recipe I have is pretty much the same. I love the walnuts- be sure to use good quality chocolate chips! My roomate just brought home some double tree cookies in a paper bag that lists the ingredients. They include ghiradelli chocolate, cinnamon, and lemon juice concetrate. These were AMAZING! I’ve been looking for ages for a “go to” chocolate chip cookie recipe and this is definitely it – thank you so much!